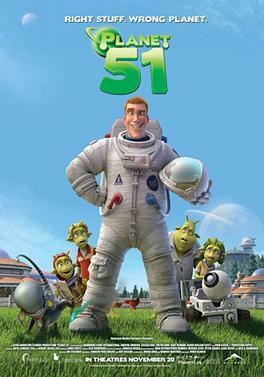 The movie is about an astronaut who thinks he is the first human that lands on Planet 51. But Surprise surprise its actually a populated planet with little green people living with white picket fence that looks more like 1950's of America. The alien family's dog looks like a cute miniature xenomorph alien from the Alien movies.It pisses out very corrosive acid(The trailer shows the piss melts the lamp post metal) just like the xenomorph's blood. The movie has an amazing voice actor notably Dwayne Johnson(The Rock )as Chuck the astronaut, Justin Long as Lem ,Sean William Scott as Skiff ,Jessica Biel as Neera, Gary Oldman as General Grawl and John Cleese as Professer Kipple. It looks kind of like an alien satellite planet astronaut humor that we've been long waiting for since space monkeys. So finally we have the answer. We are not alone in the universe and they are not from Neptune or even Jupiter but planet 51.